The essays in this volume focus on the role of women in the work force. 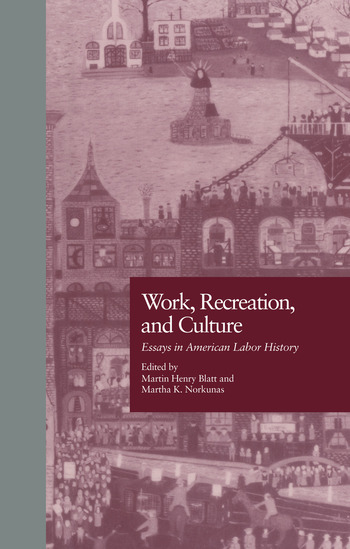 They explore how organized sports, social associations of all kinds and the educational system faced by the children of worker were profoundly linked to work place and community activism. They examine why radical labor organizations that could win major strikes often could not sustain themselves as permanent institutions. Finally, the essays argue that simultaneous leadership changes in management and labor in the auto industry were less the result of internal conflicts than needed structural adjustments to changing economic and political realities. Interwoven into all of the essays is the intricate dynamic between immigrant and native-born, between different immigrant waves and the groups, and between workers at different skill levels. Work, Recreation, and Culture enriches and expands the established labor narratives. Martin Blatt received his Ph.D. in American Studies from Boston University. He is the author of Free Love an Anarchism: The Biography of Ezra Heywood and the co-editor of The Meaning of Slavery in the North. Currently he is the Chief of Cultural Resources/Historian at Boston National Historical Park. Martha Norkunas received her Ph.D. in Folklore from Indiana University. Her book, The Politics of Public Memory, received the 1994 Historic Preservation Book Award. She served as Cultural Affairs Director for the Lowell Historic Preservation Commission from 1989-1994. Currently she is Oral and Public Historian at the Center for American History at the University of Texas at Austin.